Weppler: Mayor stars in TV ad. Libertyville, Ill., has set aside $70,000 in taxpayer money to encourage local car purchases. - Consumers get up to $200 in gift certificates when they buy or lease new vehicles from any of the town's 12 dealerships. - Certificates are redeemable at 86 local retail businesses or for aftermarket products at the dealerships. - For each vehicle sold, dealers will donate $100 to one of nine local charities. Over breakfast one day in early 2009, Glenn Bockwinkel, president of Acura of Libertyville in Libertyville, Ill., proposed a radical idea to the mayor of his town: Use taxpayer dollars to fund an incentive program to get people to buy new cars. "I knew the village was looking for revenue, too. I thought, 'Is there a way to carve out some money and give it back to the consumers to spend in the village?'" Bockwinkel recalled. The mayor agreed to set aside $60,000 for Bockwinkel's plan. Initially, there was some pushback from residents over the use of tax dollars because money was tight then. But the program ultimately worked. "It helped save dealerships and businesses in tough times," said Mayor Terry Weppler. "Some of the towns around us lost two or three dealerships. We didn't lose any." Now the village is at it again. Its Shop Libertyville Rewards program gives consumers up to $200 in gift certificates when they buy or lease new vehicles from any dealership in Libertyville. The gift certificates are redeemable at certain local retail businesses or for aftermarket products at the dealerships. Additionally, when customers buy new cars under the program, dealers will donate $100 for each vehicle sold to one of nine local charities. "We realized this time no one would feel sorry for car dealers since things are going well," Bockwinkel said. "So to win support, we decided to tie it to charity." Libertyville, 30 miles north of Chicago, has a population of about 20,500. The affluent suburb is best known as the hometown of the late actor Marlon Brando and two-time presidential candidate Adlai Stevenson. But dealers there want it to be known for the Libertyville Mile of Cars, an organization of the 12 Libertyville dealerships. The dealers created it in 2009 in an effort to align in support of the community. It has become a destination for consumers to buy cars, spurred on by the initial 2009 Shop Libertyville Rewards, Bockwinkel said. 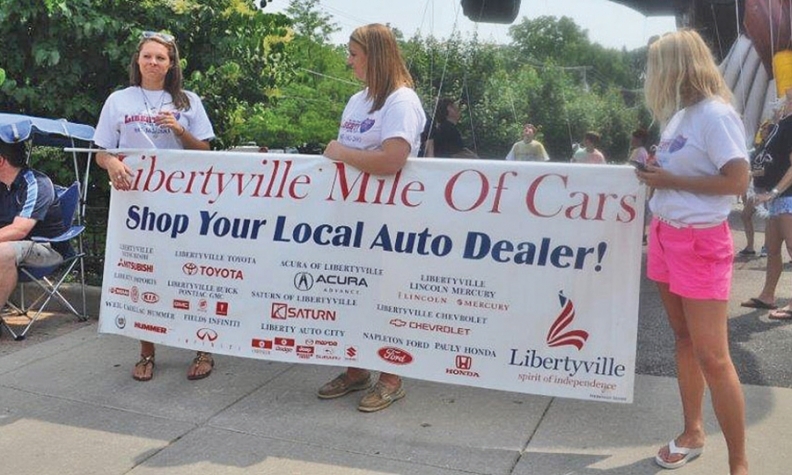 Twelve local auto dealerships belong to the Libertyville (Ill.) Mile of Cars. "We were able to do this promotion then, and it got a lot of attention," Bockwinkel said. "That allowed us to continue over the years to market the Mile of Cars in Libertyville as a destination to go buy cars." The first time, about 40 local businesses participated in the program, and only $41,000 of the $60,000 in reward coupons was redeemed, he said. Customers used the coupons mostly at the grocery and hardware stores because of the recession. This time, the village is allocating $70,000, and 86 of the nearly 900 businesses in Libertyville have agreed to honor the gift certificates, Weppler said. Bockwinkel hopes to see most, if not all, of the certificates redeemed. He has arranged to send up to three emails to those customers who earn the gift certificates reminding them of the expiration date. Here's how it works. The first 30 customers buying or leasing new vehicles at each of the 12 Libertyville dealerships July 6-31 -- up to 360 customers -- will receive vouchers. Customers take the vouchers to the village offices to exchange them for reward certificates, Bockwinkel said. Libertyville residents get $200 certificates, and nonresidents get $100 ones. The certificates expire Oct. 31. Each of the 12 dealers will donate $100 to each customer's local charity of choice. That means each dealer will donate up to $3,000 to charity for a total of $36,000. To promote the program, Weppler is starring in a cable TV commercial funded by the dealers that will air 1,600 times, he said. They will also run newspaper and radio ads. The mayor said this time the program is widely supported by residents because he has emphasized to them that "68 cents of every dollar spent in a community stays in that community." He said auto-related businesses represent about 60 percent of all sales tax receipts received by Libertyville. Dealerships also employ nearly 800 people. "We wanted to let our residents know how much our car dealers do for us and how that money stays in our community," Weppler said. Bockwinkel said this program also helps the dealers build customer retention. "It's a unique approach," Bockwinkel said. "When they buy a car, they're still loyal to the dealer for a long time, and dealers are more concerned than ever about retaining those customers because they understand the value of that customer using the service department."